Plus Mother’s Day gifts, recycling, chain maille, PMC and much more! Whilst every care is taken in the writing, research and preparation of this magazine, the publisher cannot be held responsible for any errors in articles or advertisements, or for the contents of websites reviewed. The views expressed herein are not necessarily the opinion of the publisher. All copyrights and trademarks are acknowledged. section starting on page 49 has a wealth of gorgeous projects and brilliant ideas for every occasion. We’ve also gone wild for pendants this issue, thanks to our talented design team, which has conjured a glorious array of striking pieces using techniques and materials you may not have considered. From Sarah Goode’s upcycled delights to Su Pennick’s decorated Fragments charms, Sarah Austin’s Celtic-weave chain maille and Emma Gordon’s magic touch with PMC and paints, there are suggestions galore for focal pieces that will be completely unique and personal to you. On top of all that, we’ve been getting to grips with global colour authority Pantone’s ofﬁcial shade of 2012. Though not for the faint-hearted, the vivid red-orange of Tangerine Tango certainly lends itself to dramatic earrings and chokers with a little Latin ﬂair, as Mel Brooke and Claire Humpherson demonstrate on pages 17 and 58. Happy beading! FREE WITH THIS ISSUE We hope you enjoy our bonus project book this issue, packed with unusual beading and knotting techniques for designs that are a little bit different. If it inspires you to try something new, please do let us know! PUBLISHING & ADVERTISING Publishing Assistant – Janice Whitton janice.whitton@practicalpublishing.co.uk Group Sales Manager – Kevin Edwards kevin.edwards@practicalpublishing.co.uk Advertising Sales Executive – Cathy Campbell cathy.campbell@practicalpublishing.co.uk Tel: 0844 826 0615 Advertising Co-ordinator – Rachael Edmunds Specialist Retail Account Manager – Chris Cooke chris.cooke@practicalpublishing.co.uk Associate Publisher – Louisa Castle Publishing Director – Dave Cusick Financial Director – Karen Battrick Managing Director – Danny Bowler Chairman – Robin Wilkinson The publisher welcomes contributions from readers. All such contributions and submissions to the magazine are sent to and accepted by the publisher on the basis of a non-exclusive transferable worldwide licence unless otherwise agreed in writing prior to first publication. Such submissions are also subject to being used, reproduced, modified, published, edited, translated, distributed and displayed in any media or medium, or any form, format or forum now known or hereafter developed, for any purpose, in perpetuity. 74 Give It A Whirl! HAPPY NEW HOME Precious Sparkle Beads has moved! The shop, which specialises in gorgeous gemstone beads, is still located in the historic city of Perth in central Scotland, but now has a new space in the heart of the town, which also boasts a toy shop on the cellar level with a large number of kits and things for children to make and do. An impressive programme of workshops is also available on the premises at 10 Charlotte Street, Perth PH1 5LL. See www.precioussparklebeads.co.uk or call 01738 630740 for more details. ADVENTURES IN WOOL Fans of The Bead Shop Scotland’s wonderfully traditional but on-trend style may be excited to learn that the team is branching out. If you fancy trying your hand at knitting or crochet as an alternative craft – or even to combine with your beading skills and designs – the new Wool Shop Scotland, based at the bead store in Haddington, is now offering a programme of crochet workshops, including all the yarn you’ll need and a crochet hook to take home. Complete beginners are welcome, and there are plenty of ideas for those with more experience too. Visit www.beadshopscotland.co.uk or call 01620 822886 for more information. style – think planets, sundials, sailing boats and timepieces. Prices for these miniature works of art start at 50p each from www.beadsunlimited.co.uk, but three lucky readers can each claim a mixed selection of the charms worth £6.80 this issue. As we reported last issue, Shiney Company’s Bristol store has relocated to larger premises in the Brislington area of the city. Owners and regular CB&J designers Amanda Pickstock and Jane Purdy and the team have been busy getting settled in and turning the new space into a beading mecca, and we’ve now had a glimpse inside! Find the new shop at 14 Sandy Park Road, Brislington, Bristol BS4 3PE; www.shineyrocks.co.uk; 0117 300 9800. DID YOU KNOW? Each month is traditionally associated with a birth ﬂower as well as a birthstone, so why not give an extra individual touch to a piece of gift jewellery this year by incorporating an appropriate bloom? Some of these ﬂowers are available in the form of acrylic, Lucite, ceramic, lampwork or polymer clay beads, while you could aim to catch the essence of others, with a spray of small white crystals to represent lily of the valley, for example. and – of course – Kate Middleton, who brought lace right up-to-date at last year’s Royal Wedding, look at embellishments or a soft lattice effect rather than full-on lace cuffs! beads, ﬁndings and accessories, which often has regulars in situ, working on their latest projects. We’re particularly smitten with some of the unusual glass foil beads. Go to www.anastasiabeads.co.uk to ﬁnd out more. Just down the road at the Ty Verlon Industrial Estate is the warehouse HQ of Boxes & Busts, including its smart and vibrant Bead Room. Drop in on 31st March or 1st or 2nd April and you’ll catch one of the company’s open days, complete with a host of jewellery-making demonstrations between 10am and 4pm. See www.boxesandbusts.co.uk for further details. to feel conﬁdent enough in my work to be able to sell my jewellery in the future. Amy Taylor, by email CB&J: We’re delighted to have been able to help! We love to see the way readers take elements from the projects created by our design team to make their own unique jewellery. Please keep sending in your pictures. much more. Classes are run regularly and The Bead Cellar offers a variety of kits suitable for all experience levels. New stock arrives regularly and Kate is always on hand to offer friendly advice to customers. bead. Pass back down through the bugle and 6mm bead, and around the green seed bead. Repeat a further four times, spreading the black bugles out around the gold one. green 6mm beads to make the tulip stem – the final length is down to personal preference. Add a green seed bead before passing back up through the 6mm beads. Tie a knot to secure. three or four completed beaded tulip ﬂower stems onto a brooch pin, making sure the ﬂower heads lie in a nice cluster. Tie some co-ordinating ribbon around the stems for the ﬁnishing touch. applications such as heat embossing, wood burning, and ink drying 7700 7.2V NiCad cordless rotary tool kit – an easy-to-use multi-tool that can be used for all kinds of creative hobbies, allowing you to engrave, drill, sand and polish a variety of different materials from wood to glass. For your chance to win a set of these must-have tools from Dremel, send your name, address and email on a postcard to CB&J21 Dremel, Practical Publishing, Unit 1 Adlington Court, Adlington Business Park, Macclesfield, Cheshire SK10 4NL to arrive by 12th April 2012 NB: By entering this competition, you accept that your details may be passed on to a third party. Dremel tools to be won! When Mel launched www.beadsbylili.com she had a hunch that beading and jewellery making would become popular in the UK. Like many others, she started out designing and selling jewellery pieces at local craft fairs but, she says, “it was difficult to source interesting, fashionable beads, so I began to spend a lot of time working on that to the point where the bead side of the business took over”. So Beads by Lili was born, with the strapline ‘We dream of beads’ because, Mel says, “beading and fashion is my passion and I literally would dream of beads!”. second jump ring to the loop on the bottom of the flower spacer. Then use a third jump ring to attach the second beaded strand to that. Finally, use a fourth jump ring to attach the third beaded strand to the third jump ring. Repeat Steps 5 and 6 to complete the second earring. ABOUT GILL… Gill Teasdale is one of the resident designers for JillyBeads, a friendly, fun, family-run business based in the north of England, which was created in 2001 out of a love for beautiful beads, together with a desire to run an online business. The team at JillyBeads is always on the lookout for new, tantalising and useful products.The dynamic website is regularly updated with exciting goodies, along with creative design ideas. Gill’s work features regularly in the beading press and on the company’s website. the hinge of a knot cover, from inside the ‘shell’ out. Close the knot cover carefully using chain-nosed pliers. Thread on a pearl and 10 seed beads. Repeat this sequence another seven times. Thread on a pearl, a small briolette, a pearl, 10 seed beads and a final pearl. Remove one strand of thread from the needle, then thread on four more seed beads. and another pearl. Separate the needles and thread seven seed beads onto one thread. Onto the other, thread five seed beads, a 6mm Xilion, five seed beads, a pearl, the large briolette, a pearl and five more seed beads. Pass the needle back up through the Xilion, then add another five seed beads. Pass both needles through a pearl and 10 seed beads. Separate the needles again and using one of them (and bringing the other needle into the work as directed), repeat the beading sequence from Step 3. Remove one of the needles, then thread both strands onto the remaining needle. Thread on a small briolette and a pearl. Thread on 10 seed beads and a pearl. Repeat another seven times. Pass the needle though the hole in the hinge of the remaining knot cover, this time from the outside in. Thread on a seed bead, pushing it down into the knot cover. Make sure there is no slack thread along the necklace and that all the beads are pulled up nicely (but not too tightly). Tie a knot around the seed bead in the knot cover. Close the cover. Wind the last link of the extension chain (the end without the heart) onto one of the split rings. Wind the loop on the bolt ring onto the other split ring. Hook one of the split rings onto the open loop on one of the knot covers. Close the loop tightly using chain-nosed pliers. Repeat with the other ring and knot cover. This eclectic collection of interesting feature beads is only a suggestion – make your selection multicoloured or change the colour to suit your mum. Or why not pick charms and trinkets that have special meaning to her? bead with two filigree rounds; the Ornate Orb bead with two 2mm antique copper rounds. Slip a jump ring onto a strand of thong (not the chain) on one of the knots. Hang on one of the wrapped loop dangles and close the jump ring securely. Repeat using the remaining dangles, hanging one on each of the remaining knots. TO CREATE Thread the needle onto the end of the cotton thread, then thread on all the Delicas, pushing them down the reel as necessary. Don’t cut the thread – work from the reel as you would if you were crocheting normally. Remove the needle. Leaving a tail of 3-4cm, tie a loop in the end of the thread and insert the crochet hook into the loop. Crochet three chain stitches. Push a bead up to the hook. Hook the hook under and over the thread as before, pulling through another loop and making sure the bead is caught on the thread between the last stitch and the new loop. Pull the thread up neatly and tightly. as possible to the end fastener. Cut the thong and the chain so that they measure exactly the same length as the crocheted strand (not counting the tail). Grip these ends in the other end fastener, as in Step 4. Slip the pendant mount onto the heart, lining up the hole with the prongs inside the mount. Gently squeeze the mount to hold the pendant in place, and double check it is secure. Slip the pendant mount over one of the end fasteners and onto the strands. Wind the loop on the trigger catch onto one of the split rings. Wind the split ring onto the loop on one of the end fasteners. Wind the other split ring onto the loop on the other end fastener. Your finished necklace will measure around 50cm (20”). To make it longer, add more beads to the cotton thread before crocheting; to make it smaller, simply use fewer beads and crochet a shorter length. E-Beads (www.e-beads.co.uk; 020 7367 6217) has donated these fabulous jewellery starter kits, which include a selection of beads, ﬁndings, tools and instructions – everything needed to encourage a new passion for jewellery making. These lovely sets of mixed strands of Amazonite and rhodonite beads have been donated by Beads Direct (www.beadsdirect.co.uk; 01509 218028). Each set includes three strands of each stone in different shapes. Over £300 worth of prizes to be won! CHARMING BEADS JEWELLERY KITS 10 TO GIVE AWAY, WORTH £5 EACH These fabulous jewellery kits include a selection of stunning handmade Indian beads, suitable for creations all year round, and have been donated by beads, charm and ﬁndings stockist Charming Beads (www.charming-beads.co.uk; 0843 2211 400), which specialises in Pandora-style bracelets, beads, charms, stoppers and necklaces. Prize colours, bead shapes and sizes will vary. ABOUT EMMAâ&#x20AC;Ś Emma runs Bluebell Design Studio in Fife, which offers the widest variety of Precious Metal Clay workshops available anywhere in Scotland. 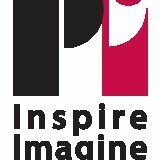 She also has an online shop specialising in PMC products. Emma loves teaching PMC and really enjoys the reaction of her firsttime students when they take a brass brush to newly fired silver! She regularly attends Master Classes to keep advancing her skills and is the Communications Director for the Metal Clay Academy, an independent website offering a vast resource for the established artist as well as the complete beginner. MAKE YOUR OWN PENDANTS PMC WITH COLOUR TO CREATE Apply a little Badger Balm or olive oil to your mat and your chosen texture sheet. Roll out the silver clay to a thickness of four cards on your mat, then roll out on your texture sheet to a thickness of three cards. This two-stage rolling process will ensure that you get a good texture on your clay (see Fig 1, below left). TOP TIP When you are cutting out your shape, especially if you are cutting out more than one shape on the same piece as demonstrated here, do so on a smaller mat that can be set aside for drying. This way you will minimise distortion of the shape that, especially if you use a heat source, such as a dehydrator or a hairdryer, to dry your work. Once ready, put in your domestic oven at 160°c for 40 minutes. Set your pendant with your chosen chain or ribbon and it’s ready to wear! allowed for an array of colours, with many people now choosing coloured cord over the traditional black to personalise the look further. Visit www. spoiltrottenbeads.co.uk, www.jillybeads.co.uk, www.beadsunlimited. co.uk and www.beads direct.co.uk for more ideas and inspiration. easier to make them using bead release so that you can create them on the most accessible area of the rod, then move them into place later. The other thing to check before you start is, of course, that your chosen cutlery or rod is made of steel or iron and won’t react adversely to the heat of your ﬂame. Good luck! Please let us know how you get on. beaded strands, such as this ﬂoral focal, designed by Sarah Millsop of Beader’s Companion for Issue 19 of CB&J. A bead spinner would also be helpful if you fancy trying your hand at bead crochet or knitting. resolution’ article in Issue 20 of CB&J or her upcoming feature in Issue 22 (see page 98 for further details). Sarah’s love of chain maille began with her interest in medieval history, which led her onto starting her own maille shirt. This was abandoned when she discovered coloured jump rings and the fact that you can use chain maille to make jewellery! Sarah runs Beadsisters with her husband, Steve. right). Repeat a further four times. Link two C rings around the two E rings between two A rings – you will thread your thong through these rings. Attach the cord ends to the thong. Add the lobster clasp and extension chain to the cord ends using the oval jump rings. bottom layer. Repeat using one B ring and another C ring. Repeat seven times. Link two C rings around one top and one bottom A ring on the outside edge of your wheel – you will thread your thong through these rings. Attach the cord ends to the thong. Add the lobster clasp and extension chain to the cord ends using the oval jump rings. Link 10 closed G rings to the C ring. Link one A ring to two of the G rings added in Step 1. Repeat four times. Referring to Fig 1 (right), link one A ring through a G ring in one of the pairs from Step 2 and through an adjacent ring in the next pair. Repeat four times. Link five B rings through the same G rings as the A rings added in Step 3 (Fig 1). For the final layer, link one A ring through the same pair of G rings linked in Step 2. Repeat four times. Referring to Fig 2, join one D ring at the outer edge, where three A rings and one B ring intersect. Repeat nine times. Link one B ring around parallel A rings in the top and bottom layers – you will thread your thong through this ring. Attach the cord ends to the thong. the cord ends using the oval jump rings. TO CREATE Cut two rectangles of quilting material the desired size of your finished pendant, leaving 3/8” seam allowance all around. With the ‘right’ sides facing each other, sew along three edges, then turn inside out. Cut a piece of wadding to fit the inside of the pendant base. Turn in the seam allowance of the remaining edge and pin, then sew closed using tiny stitches. Using Nymo thread, first sew any larger beads, buttons or sequins into position, then add a selection of smaller beads until the whole front area of the pendant is covered. Sew the bail to the top point of the pendant and thread it onto your desired necklace. WIN! Tickets to three fabulous shows up for grabs! forward to hosting a new series of workshops. Due to demand, these can be booked in advance to avoid disappointment so visit www.sccshows.co.uk to reserve your place. At Shepton Mallet, Katie Pirson (a traditional hand-embroiderer) will be running workshops for the ﬁrst time, while Jan Tillet returns with a new ‘Stitch it, shrink it, love your wrinkles!’ machine embroidery project. Create a richly textured piece of embroidery using the sewing machine zigzag stitch, scraps of fabric and shrink polyester. With all this and so much more to explore and enjoy, a visit to The Creative Crafts Show allows you to indulge your passion for everything crafty, and head home with a wealth of exciting ideas and inspiration. For your chance to win a pair of tickets to one of these three great shows, send your name and address on a postcard to CB&J21 Creative Crafts Show followed by the location of the show you’d like to attend, Practical Publishing, Unit 1 Adlington Court, Adlington Business Park, Macclesfield, Cheshire SK10 4NL to arrive by 5th April 2012 NB: By entering this competition, you accept that your details may be passed on to a third party. Don’t be shy! Share your creations with us and you could see them on our gallery pages! To submit your work for publication either email an image to lindsey.hopkins@practicalpublishing.co.uk or send your project with a stamped addressed envelope for return to CB&J Gallery, Practical Publishing, Unit 1 Adlington Court, Adlington Business Park, Macclesﬁeld, Cheshire SK10 4NL. Don’t forget to include a list of the materials you used. of the second large circular connector. Using 7mm jump rings, attach a 12-link length of chain to the other gear charm at one end and the right-hand ring of the first connector at the other. Attach a two-link chain length to the same gear charm and to the other beaded eyepin. Connect the other end of the eyepin to a two-link length of chain, then link this to the left-hand ring of the second connector. Attach the required lengths of chain and clasps to the single rings on each connector. both chains together with a jump ring. Thread a jump ring through the hole in the Fragment Charm and through the jump ring holding the two chains. containing black beads. Use jump rings to attach one end to the jump ring connected to the charm, and the other end to a clasp. TO CREATE Use a thin layer of Glossy Accents to stick five square Fragments charms to your chosen areas of the patterned paper. Press down firmly to ensure that the whole of each charm’s surface is coated and to remove any air bubbles. Leave to dry thoroughly. Trim the paper around the charms and use a sanding block to smooth and neaten the edges. Pierce a threading hole through the paper and cover the back with a protective coat of Glossy Accents. Leave to dry. Cut a 19cm length of large-link chain. Attach the two ends to the two parts of the toggle clasp by opening and closing the links in the same way you would a jump ring. flower beads and a silver ring onto it, then attach it to a link in the bracelet chain between the charms. Repeat five more times, evenly spacing the rings and flowers, to finish. covers onto the necklace threads if you wish. To add the pendant, thread the heart onto the ball headpin, topped with a metal spacer bead. Use roundnosed pliers to turn a loop in the end of the pin. Finally, use a 7mm jump ring to attach the heart to the centre of the necklace around all three strands. 2½” long. Thread three pearls onto each length and make a wrapped loop at each end as in Step 1 (Fig 3). Connect the wrapped shells and pearls using jump rings, or figure-of-eight components for a more unusual and decorative finish. These are ‘3’shaped connectors that look like an ‘8’ when closed and they do not twist open like a jump ring does – instead, you pull one side up, hook it on, then push the side back down (Fig 4). Further embellish the necklace by adding some interesting wire shapes. Cut varying lengths of 1.2mm wire (at least 3”) and use round-nosed pliers to start a loop at one end. Switch to either chainnosed or flat-nosed pliers to grip the loop, and keep turning (Fig 5). Create a small loop at the opposite end. Make four or five of these coils. Cut a 10” length of 0.6mm wire and thread it through the small loops on your wire swirls. Wrap it around to secure (Fig 6), and create a loop at the top to give an attachment point. Continue by adding pearls and wrapping, to create a cluster around the top. Attach to the centre of the necklace. over the knot (see Fig 1, right) – it will be obvious if it’s wrong! When your bracelet is the desired length, thread on the second clamshell, then tie a knot into the calotte. This is a little bit tricky, but persevere! Attach the two parts of your clasp using an oval jump ring through the loop of the calotte at each end. crimp onto both strands together. Squeeze the first crimp close to the pearls. Then squeeze the second crimp, having pushed it down into the calotte. Fold the calotte over this crimp (Fig 2). Open an ear wire, hook it through the loop of the calotte, and close. Repeat Steps 1 and 2 to make the matching earring. ABOUT CLAIRE… Claire has always been creative, and six years ago she set up Claire’s Crystal Classics (www.clairescrystal classics.co.uk), selling her jewellery and accessories. She likes working with silver and gold, together with handmade lampwork beads and gemstones, including freshwater pearls. She is also inspired to make funky jewellery with the use of buttons. Claire is a self-taught artist with the exception of enrolling onto a silversmithing course, and her motto is that anything is possible. rice pearls. Move these to the centre of the cord and cross the ends through the top two holes of a sew-on oval diamante. Thread each side back through each pearl and cross over through the holes in the diamante again. Add one pearl to each strand and cross over through the bottom two holes of the diamante. Add a pearl to both strands and cross the cords over through another pearl. Feed the cord back down through a pearl on each side and add a further pearl to the right side. Continue feeding the cord back through a further pearl on each side and tie off, using a square knot for a more secure finish and dabbing with GS Hypo Cement. Cut off the excess cord once the glue has dried fully. Repeat Steps 1-6 to make the matching earring. GLAMOUR PEACOCK PEARL BRACELET TO CREATE Cut two 10” lengths of Tigertail. Thread one strand through one side of a heart toggle clasp and crimp to secure. Add a selection of freshwater rice pearls and clear Swarovski faceted round beads in a pattern that suits you. Periodically add one of the two-hole flower details and continue adding the beads until you are approximately halfway. Now add your heart charm dangle and continue adding the pearls, crystals and flowers, ensuring the pattern balances evenly on each side. Continue beading until the bracelet reaches your desired length – an average-size bracelet measures approximately 7½” including the clasp. Finish the first strand by crimping to the other side of the toggle clasp. Repeat the process to make the second strand, ensuring that you pass the wire through the second hole of the two-hole flower details as you go round. Crimp and trim off any excess Tigertail for a neat finish. then add a bow or curl of crin. Add your top feathers – I have chosen a vibrant peacock feather and smaller single white feathers for contrast. Finally, glue on your paste button or crystal brooch at the base of your focal feather for a beautiful, glamorous finishing touch. ABOUT DEBORAH… Deborah has been making jewellery for about four years and, apart from a few classes in the early days, is self-taught. “I come from a crafty family,” she explains. “My mother made a lot of my clothes as a child and my grandmother was a terrific knitter. I’ve dabbled in both those disciplines but jewellery is my main love. I have repaired and remodelled jewellery since I was a child and the logical next step seemed to be to design from scratch.” Deborah has recently started selling her jewellery at a local outlet and her designs have appeared in various books and magazines. She enjoys working with simple techniques but a variety of resources, including wire, fabric, leather and feathers, as well as the more usual beading materials. “I believe the right components and colour combinations can be every bit as striking as more complex pieces,” she says. then back through the crimp and the last seed bead. Squash the crimp and trim the end of the Tigertail. Finish the other side of the necklace to match the first, using a 5cm length of chain in place of the clasp. Add the heart to the end of the chain as a charm, using a jump ring. Cut eight 2.5cm pieces of chain. Using a piece of wire, form a simple loop and add a Xilion. Trim the wire to about 1cm and form another loop. Repeat six times. Use these bead components to link together the chain sections, then attach the completed beaded chain to the main necklace as shown. in opposite directions through the remaining holes of the slider as before. Pull tight. Repeat this threading pattern twice more. Finish with a final pearl and flower slider unit. Thread four seed beads and a crystal onto each side, then pass the Tigertail in opposite directions through a crimp. Ensure there is no slack in the bracelet before squashing the crimp with pliers. Thread the ends of the Tigertail through a few beads on each side for security, then trim. Attach a crystal heart to the end of a short length of chain with a jump ring and attach the chain to the bracelet, to cover the crimp, with a final jump ring. TO CREATE Cut two 60cm lengths of Tigertail. Thread a crimp bead onto both strands, loop them through the clasp and back through the crimp, and squeeze to secure. Add a crimp cover. Thread 10 seed beads onto each strand. this pattern a further 12 times. Add a final10 seed beads to each strand and thread on a crimp bead. Pass the wire through a jump ring, then back through the crimp, and squeeze it closed. Add a crimp cover to finish. Add a crimp bead, make a loop and secure. Cover with a crimp cover. Add an ear wire. Repeat Steps 1-3 to make the matching earring. TO CREATE Cut a 20cm length of Tigertail. Thread on two seed beads and a cream pearl, and repeat. Add two seed beads, a gold pearl and two more seed beads. Add a cream pearl and two seed beads, and repeat. Pass both ends of the Tigertail through a gold pearl in opposite directions and add six seed beads to each. TO CREATE TO MAKE AN EIGHT-WARP KUMIHIMO BRAID WITH ADDED BEADS Note: You will need a braiding board with notches to place your thread – each cord placed into a single notch on the board is known as a ‘warp’. Take a 5m length of red rattail and cut it in half. Fold each cord in half again to create four ends. Repeat with a second 5m length, folding one 2.5m piece in half and putting the other to one side. Cut two 3m lengths of gold thread and knot all your working strands together so you have eight ends. Place the knot through the hole in the centre of the braiding board. Spread the cords, placing a warp each side of each dot on the board. Make sure the two gold threads sit opposite each other – if one is to the right of a dot, the other should be to the left of the opposite dot. and knot them together so that the braid doesn’t unravel. Now whip the ends to secure – to do this, wrap Nymo thread tightly around the braid just below the knot, and sew through the braid a couple of times to make sure it is securely fastened. When you are happy that you have secured the braid, use sharp scissors to cut off the knot close to the whip. by sewing at the top and bottom, and at the sides of the rose. This will stop the flower from drooping too much when worn. ABOUT ANNA… From a background studying theatre design and costume history, Anna now focuses her creative energies on jewellery design and the online bead shop www. bigbeadlittlebead.com. Big Bead Little Bead prides itself on offering vintage and one-off artist made beads not available elsewhere, plus a great range of classic Czech glass, metal filigrees, crystals, brass and silver charms, and everything else you need to make original-looking jewellery. placing a farfalle bead at the centre of each. Wire each of the leaves using a 5cm length of 0.3mm copper beading wire. Pass the end through the hole in the leaf and arrange the leaf at the midpoint of the wire length. Fold to bring the two ends together, and twist. Use round-nosed pliers to form a wrapped loop and trim any ends. Take the two fancy filigree embellishments and bend them along a line just to the left of the flowers positioned centrally in the design. You will be able to use your fingers to bend the metal. Use glue to attach the filigree embellishments to the bronze bird in frame pendant, positioning them each side of the flower near the top of the pendant. Glue a couple of small beads into the centre of the two metal flowers on the pendant. half of the magnetic clasp. Thread the wire end back through the crimp and through a few of the beads. Close the crimp and trim the wire end. Repeat Step 7 for the other side of the necklace to complete. ISSUE 5 ON SALE NOW! We asked a trio of talented designers to get busy with the same selection of beads – with delightfully different results! LINDSEY SAYS… This is a wonderfully vibrant bead set for spring and summer makes! I particularly loved the polymer clay flowers and newspaper beads. creating a large loop. Attach your desired length of chain just above the bead to create an oversized necklace. Thread two newspaper beads and two petal beads individually onto eyepins, turning a loop in the end of each pin. Measuring equal lengths along the necklace, cut the chain and attach the beads using jump rings through the eyepin loops. TO CREATE Create your basic bracelet by attaching pairs of jump rings and single glass and wooden doughnut beads in an alternating pattern. Secure both ends of the bracelet to a lobster clasp using jump rings. Create an extra length of bracelet chain, around 3” long, using the same alternating pattern. Attach this along the centre of the main bracelet. Feed eyepins through six wooden flower beads and coil the pin ends. Attach to the bracelet in random order using jump rings. Hang two additional beads from the first polymer clay bead, using jump rings. Add two more flowers to the free jump ring from Step 3. Finish with a small polymer clay flower dangling from the bottom of the final larger flower. Repeat Steps 2-5 to create the matching earring. TO CREATE Feed your chosen flower beads individually onto eyepins and coil the pin ends. Attach the smallest bead to the ear wire with a jump ring. Add another jump ring to the ear wire loop. Add one of the polymer clay beads to the free jump ring. Attach another jump ring to the same one. ANDRE CURRAN DESIGNER CJ BEADERS ANDRE SAYS... This necklace has a lovely childlike feel in its bright girly palette and simplicity, while keeping a contemporary style. The twisting wire technique can help you develop towards making tiaras and combs. I created the sweet heart flower bracelet as a spring delight. With petals made of hearts, these flowers hold lots of love! crimps to finish the ends of your ribbons, then attach an extension chain and lobster clasp with jump rings. your thumb and finger and drag the wire around until you have three wraps, then trim with wire cutters and tuck in the ends using chain-nosed pliers, making sure there are no rough edges. Thread on a doughnut bead, bend the wire over 0.3mm away from the bead and repeat the same process so you have a wrapped wire connector. Repeat this method to link the three flowers together, with the largest in the middle, and to add a doughnut bead and then your clasp elements to each end. pliers then trim with wire cutters. Thread a polymer clay flower bead onto an eyepin (or make your own using 0.71mm wire). Use this eyepin to connect the drop from Step 1 to your ear wire. Repeat Steps 1 and 2 to make the second earring, taking extra care that your headpins are level. JUDITH HANNINGTON DESIGNER JUDITH SAYS... Wow! What a bead selection and quite a challenge in knowing where to begin. A lot of the brightest beads looked quite young in style so that was my starting point with the mix-and-match necklace. The focal Fimo bracelet was an extension of this but is a little more subtle and would suit any age of wearer, whilst the tassel necklace is an altogether more sophisticated but still trendy piece. components into the centre of the patterned ring on the bracelet and set aside in a level position overnight. around each side of the ring before threading both through a single round – pull the threads snug so that the bead sits in the centre of the ring. Split the ends again and pass one around each side of the wooden ring before adding your next bead onto both threads together. Add a crimp bead to the thread ends and pass them through the wire guardian and your lobster clasp before bringing them back through the crimp and several beads. Pull the threads snug and set the crimp tightly before snipping the excess. Repeat for the other half of the necklace, replacing the lobster clasp with a jump ring. pin from the centre link of the chain. To make the tassel, thread two small and one medium turquoise hearts onto headpins and form a simple loop in the pin snug to the top of each heart. Hang these and small turquoise discs on the ends of different lengths of chain before connecting the chains together using a jump ring. Connect this ring to the bottom eyepin loop on the necklace. Thread two eyepins with a single glass heart and a further two with a spacer disc, a glass donut and a spacer disc, finishing all with a simple loop snug to the final bead. Connect these pins together as shown to form the two sides of the necklace then add enough chain each side to make the required length, finishing with a lobster clasp and jump ring. Save 40%when you subs Creative Beads & Jewe i t o a n r i f p o s r n i jeweller y maki d n a s a e d I Subscribe to the UK’s favourite beading and jewellery magazine and learn the secrets to creating your own beautiful pieces. 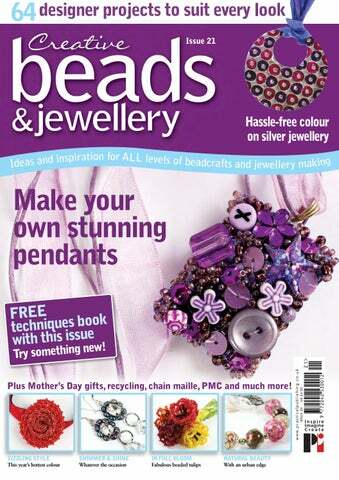 Packed with projects and step-by-step guides for all levels of jewellery making and beadcrafts, you’ll be inspired all year round! 1 7 . 2 £ t Jus sue per is Subscriber benefits: • FREE delivery direct to your door • NEVER miss an issue • HUNDREDS of jewellery making ideas every issue • COMPLETE step-by-step guides • SAVE money on every issue • PRIORITY delivery – get your issue before it appears in the shops! .29 6 1 £ t s u j r fo per year! .................................................................................................................................... .........................................POSTCODE: ...................................................................... DAYTIME TELEPHONE:............................................................................................. MOBILE TELEPHONE: ............................................................................................... EMAIL:......................................................................................................................... To give a subscription as a gift, please complete the section above and supply the recipient’s address details on a separate sheet. Please pay CDS Global Direct Debits from the account detailed in this instruction subject to safeguards assured by the Direct Debit Guarantee. I understand that this instruction may remain with CDS Global and, if so, details will be passed electronically to my Bank/Building society. nnnn nnnn SIGNATURE: ........................................................................DATE:................... Offer applies to UK only. New subscriptions will start from the next available issue. For overseas rates please visit www.practicalpublishing.co.uk/cbj I DO NOT want Practical Publishing to contact me by email n telephone n post n n Tick this box if you do not wish to receive promotional material from other companies. We specialise in Card Making, Scrapbooking & Jewellery Making. • Wedding Stationery Accessories department • Saturday Workshops • Weekly Craft Clubs • Saturday Demos • ATC Collection Point • We are open the following Sundays: 11am-3pm 4th March 2012, 1st April 2012. Jesse James Beads - We now have 46 different colour mixes from the Jesse James collection. Toggle clasp - Make a statement with these extra large toggle clasps. Coco buttons - These 38mm buttons are made from coco shell and have been beautifully hand painted. 0.5cm above the top of the bead, wrapping clockwise round the wire. Place the remaining wire sweeping down onto the bead. TOOLS down to the base at the front. Take the three strands of wire already at the base of the bead and wrap them around the strands from Step 3. You will now have six wire strands of similar lengths at the bottom of the heart. Create a spiral from each strand, angling them all in different directions. gone the wrong way, so change direction! Brentwood Bead Shop offers classes covering everything from beginners’ basics to a variety of techniques, including wirework, chain maille and corsage and tiara making. Workshops are run on Wednesday evenings 8-10pm and Saturdays 11am-1pm and 2-4pm, with other midweek sessions available on request. Classes cost £20 per person. ABOUT EMILY… Emily has been involved with beads for more than 17 years. The Bead Shop Manchester is a family business, started in 1993, but in the past Emily has branched off with her own businesses, selling beads and her jewellery at Ibiza markets, then opening a shop on the island with her father. She even studied fashion and started a clothing label with a friend, but beads called her back! Since 2000 she has been involved full-time with The Bead Shop, helping to run the business, designing kits and jewellery for the website, and teaching beading classes. Emily is self-taught and always on the lookout for new techniques and designs to inspire her. (allowing another 3cm for the clasp). Attach the magnetic clasp to the ends of the chain using jump rings to finish. ABOUT APRILâ&#x20AC;Ś April has designed for Beads Forever (formerly Just Beads) in Preston. She has a background in design and has tried her hand at lots of crafty things. She particularly loves working with wire, and Lucite flowers are always popular in the spring and summer. TO CREATE Cut a 15cm length of wire and thread on a 30mm flower then a 35mm flower. Add three seed beads, a 4mm cat’s eye bead and another three seed beads, and go back through the hole of both flowers. You should now have a beaded loop on top of the flowers. Wrap one of the wires around the other, then spread flat. Thread four 4mm cat’s eye beads onto each side. Make a loop and wrap the excess wire. a 19mm flower and a 25mm flower. At the back of the flowers, twist the wire around to secure and make a right angle, then add four 4mm cat’s eyes. Make a loop and wrap the excess wire. Now cut your chain. You will need three lengths of two 16mm loops, two lengths of five oval links, two lengths of three oval links and a length of nine oval links. Lay out the design in front of you and connect all the links using 4mm jump rings, adding a toggle between the nine-link and three-link chain lengths at the ends of the necklace links, and positioning the drop in the middle. Plus sneak previews of our latest SMITTEN KITS. Debbie has been making jewellery for about five years. She is a designer, silversmith and mum of three, and is currently the resident designer for docrafts. Slide your component onto the ring, 3 then reverse the action of your pliers to bring the ends neatly back together. FORMING A PLAIN LOOP This is the simplest way of creating a loop on a headpin, eyepin or a length of wire, ready for connecting to other components. Trim the wire end to 1cm above the Grip the tip of the wire using roundRelease the wire, rotate the pliers back 1 2 3 last bead, and make a 90Âş bend close to nosed pliers, and rotate the pliers away towards you and grip the wire again. the bead using a pair of chain-nosed or from you to start curling the wire. Continue rotating the wire and repositioning flat-nosed pliers. your pliers until the loop is formed. GLOSSARY TECHNIQUES CREATING A WRAPPED LOOP A wrapped loop is stronger than a simple loop, as it is completely closed and is perfect for heavier pendants and for creating links. Holding the loop flat using chainnosed pliers, grip the wire end using flat-nosed pliers and wind it around the stem to cover the gap between the loop and the bead. should be back at the 90º angle. Trim the end of the wire using cutters, and flatten it against the stem using flat-nosed pliers to squash any sharp edges. Position the crimp bead in the ridged 1 section of your pliers and squeeze to curl the crimp. Position the crimp bead back in the 2 oval section of your pliers, ensuring it is sitting vertically, then squeeze gently to compress the crimp to a smooth, rounded shape. FINISHING ENDS Stringing materials, such as cord or ribbon, can be knotted and the knot covered with a clam calotte. Stiffer stringing materials, such as nylon beading wire, should be ﬁnished with a crimp, which can then be covered with a clam calotte. Simply thread a calotte onto your stringing material, tie a knot or ﬁx a crimp at the end, then slide the calotte back up to the end and close the two halves for perfect concealment. Also known as snipe-nosed pliers, these have ﬂat jaws on the inside and rounded jaws on the outside and are designed for precision jobs such as creating wrapped loops. Pliers with round jaws that taper to a point are used for forming loops and curves and are ideal for creating your own jump rings. These pliers have ﬂat faces on both sides of the jaws and are used for gripping wire and jewellery components while you are working on them, and for bending and ﬂattening wire. Although chain or ﬂat-nosed pliers will sufﬁce to ﬁx crimp beads, crimping pliers give a neat, professional ﬁnish. They are two-stage pliers, speciﬁcally designed to crush and fold crimp tubes to ﬁx the position of beads on stringing material and to secure the ends. These pliers will handle cutting lengths of soft wire and trimming headpins and eyepins. The jaws are angled for a clean, ﬂush cut. Memory wire cutters are essential if you want to use this sturdy wire for creating jewellery, as it will damage the jaws of regular wire cutters. NYLON-JAW PLIERS Nylon-jaw pliers are identical to ﬂat-nosed pliers except that the jaws are moulded from plastic and are used to handle soft precious-metal wires and components that could be easily marked or dented. WIREWORKING TOOLS If you are keen to create your own wire components, a chasing hammer and steel stake are essential for ﬂattening and workhardening (toughening) wire shapes. Chasing hammers are lightweight and easy to handle, and steel stakes on which to hammer your work have an ultra-smooth surface to eliminate the chance of marking your pieces. BEADING TWEEZERS A pair of beading tweezers is handy for managing tiny seed beads and unpicking knots in stringing materials. ‘Findings’ is the word given to the group of core components needed to make jewellery. They are available in a variety of base and precious metals with a range of ﬁnishes; bronze and copper ﬁndings are now widely available, and make an interesting alternative to gold and silver. If you are speciﬁcally looking for hypo-allergenic ﬁndings, niobium and titanium components and wires are ideal and are available in a variety of colour ﬁnishes. CLASPS Used to join the ends of a bracelet or necklace together, either manually or magnetically, clasps are available in a variety of designs. They can be simple wire components or highly decorative pieces that can be an integral part of jewellery design. EYEPINS Instead of having a ﬂat or decorative head, eyepins have a looped ‘eye’ that enables other components to be attached directly to them. JUMP RINGS These are simple wire loops that are used to connect different components. Standard jump rings can be opened and closed, and you can purchase jump rings that are soldered closed when added security is required. THREAD Thread encompasses many different materials, both manmade and of natural origin, and should be chosen according to the beads in your design. Silk is perfect for threading pearls and semi-precious stones, while nylon is more suited to glass beads. You need to be able to tie a knot in the thread that is large enough to stop the beads coming off, so take this into consideration. Flat threading materials such as ribbon and suede lace are perfect for large-holed beads, and can be ﬁnished with coils or box calottes to secure the end to your clasp. SPLIT RINGS Split rings are similar to jump rings, but with two rotations of wire. They are used when added security is required. Unlike closed jump rings, they can have components added to them in the same way that keys are attached to a key ring. EAR WIRES Fish hooks are the standard ear wires used to create dangly earrings, but beaded designs can also be hung from ball and pin earrings, or even clip-on bases for non-pierced ears. HEADPINS Similar to a standard sewing pin, headpins are commonly used to make dangly elements in a piece of jewellery. Standard headpins have a ﬂattened top, but common variations include ball pins and pins with decoratively beaded ends. STRINGING MATERIALS: CHAIN There are many different chain designs made from several different metals – or modern polyester for a lightweight but chunky alternative. Use small lengths of chain in a design to link different components, or single links from a large open chain as part of a feature pendant. Coloured wires are usually copper with an enamel coating. Tigertail is a speciality twistedsteel beading wire with a nylon coating, while Soft Flex wire is similar but more ﬂexible and less prone to kinking. You can buy solid or plated silver and gold wire, and plated wire is often a good economical option (silver-plated wire won’t tarnish as quickly as solid silver). Memory wire, available in ring, bracelet and necklace sizes, is a stainless steel wire that never loses its shape. It is sold in coils that can be cut into individual rounds, strung with beads and ﬁnished with an end cap. Telephone Julie on 023 80 436333.